Dido Harding was different from almost all of the Roy Lilley guests I have witnessed over the last 4 years or so. If you have read any of my up sums of the events, you will see a theme of home grown talent, completely immersed in an often quite varied but mainly NHS job trajectory. Dido Harding had been at NHSI for a few months! So, her back story is even more pertinent perhaps? And why has she jumped into the maelstrom that is the NHS…all her friends and colleagues suggested that she shouldn’t do it. From a military family, born in Germany, brought up on a pig farm in Dorset. Granddad was a Desert Rat. Actually, a Field Marshall). Here’s the first quote, this from Granddad, who she loved deeply (emotion and touchy feels stuff will figure highly in this report). “You can’t be brave unless you are afraid”. Granddad taught her that it’s ok to be afraid. Catholic Convent in Dorset, followed by McKinsey (one of the big 6 consultancy firms then). They do suffer from a bad reputation, but Dido talked up the objective view from outside, the bought in skills that you may not have in your teams, and that ability to take a helicopter view of the leadership and culture in the organisation. She agreed with Roy that the consultants are as good as their clients. The problem is, I suppose, that if you knew exactly how to brief them specifically about the current set of problems that you are faced with, then you probably wouldn’t need them in the first place! In 25 years in business, she has used external consultants 10 times. She was sponsored through her MBA at Harvard by McKinsey and also gained a scholarship. Quid pro quo meant returning to McKinsey afterwards. She felt too young at 22. Not enough real world experience. The MBA at the very least gave her grounding in pattern recognition. Which should stand her in good stead in her new NHS role. A recurring theme surfaced in her career path. “I wanted to put my head on the chopping block”. The path went from Thomas Cook (squeezed by competitors because they only had travel agencies, and not planes and hotels), but “learnt the value of price”. Then at Tesco’s reporting to Sir Trevor Leahy, Chief Exec. No.2 to Sainsbury at the time, and a bit of a scared number two. Changed during her period there. Ruthless efficiency. Sometime at Woolworth as Commercial director – and realising she couldn’t answer the fundamental question as to “why was it there?”. Then potential being head hunted and moving to Sainsbury after being at Tesco? Her ex colleagues didn’t speak to her for some time! Sainsbury was nice, Tesco ruthlessly efficient. “You can be both”. Well said! She thought Tesco had its stumble because of the way it treated people. MP husband, a 1 year old and pregnant, and suffering the usual balancing act that falls mainly into women’s laps. “I learnt a lot from the women around me on the staff who had children but had it much harder – either single parent, or very tight budgets and more”. She is a soft skills stalwart and active practitioner. “To be an effective leader, you have to be who you really are. You cannot do it if you are trying to be someone else”. And didn’t that come to fruition when she had the the horrible experience of being Chief Exec of Talk Talk when they had the first major data breach in the UK. Web site ran slowly; Emergency call. Enacted the contingency plan; realised it was a real attack; sales team devastated because they couldn’t add orders! Then, anonymous e mail with attachment of customer data. I can’t imagine how that level of violation, followed by black mail threat, really felt. Loads of expertise, from GCHQ to BAe systems. “The breach could be a very few people, or 30 million e mail addresses”. Jeepers! Because they didn’t know what had been taken, they – mainly Dido Harding herself, I suspect – decided to tell the customers and to mainly be aware of people phoning and pretending to be Talk Talk. So, she did the people stuff again, first and foremost. Including looking after her own staff. They made mistakes, for sure. But protecting customers by warning them, and keeping staff in the loop through personal blogs (which she did 3 to 4 times a day instead of 1 per week), and then offering a free upgrade to all customers after the dust settled, which all served to save the business. After the crisis, the National Cyber Security centre was set up – “my little gift to the UK”. (The other was her team being involved in creating screw topped wine bottles. History will record which was felt the greatest achievement…). Talk Talk was better for the horrendous experience. They stopped being complacent, and turned to being a challenger for change. Now? Well NHS Improvement and NHS England cannot become one organisation, legally. (However much Roy and others press for its logic). But they are having some joint cross Board appointments. They are learning to trust each other to get on with their part. To share things, so they only do something once. And to challenge the system. As well as making sure the Secretary of State doesn’t micro manage her. One rejoinder to Roy Lilley, which I particularly enjoyed, was about looking forward not backwards. This raised a bit of a cheer. She owns a horse, who is now 30, and cost £7000. But still Cool Dawn won the Cheltenham Gold Cup back in the day. She was an amateur jockey for 20 years too. So, currently not hugely experienced in NHS, but diversely experienced as you have read. I think her lack of NHS tainting will actively be an asset. 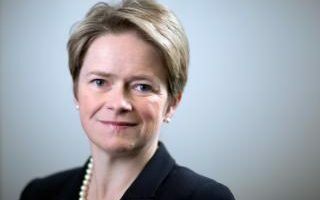 Coupled with a fearless practical intellect, and an overarching belief that getting the people parts right has to be first and foremost and the main driver of the way she leads, then NHSI, and the health service and social care as a whole, is in for an exciting time. Her level of humanity and engagement just shone through. Fabulous!